Former Homearama gem, constructed with the finest materials by renown Energy Star builder, Vince Kimbel! 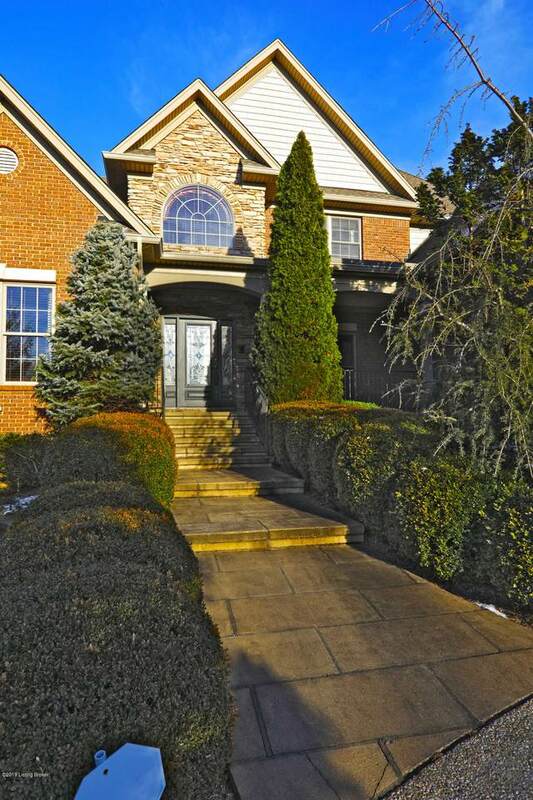 The circle driveway leads to an impressive stone and brick architecture and covered front porch. 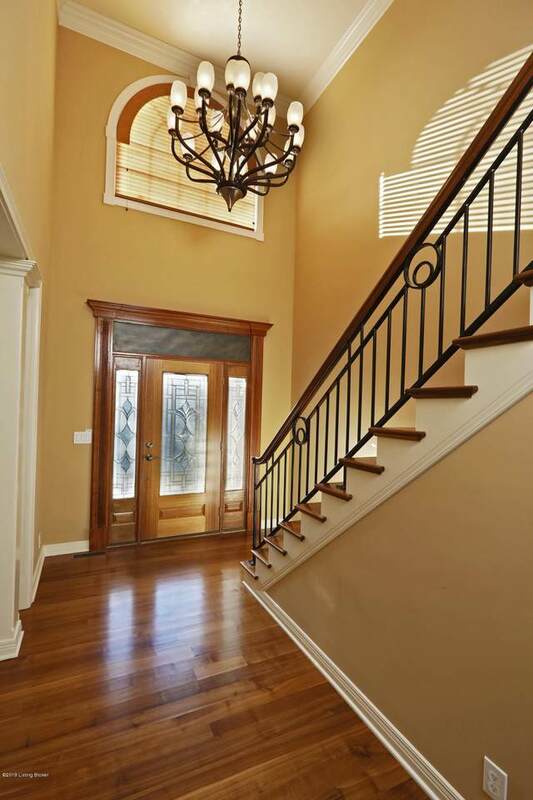 Upon entering the gracious foyer, you'll find walnut plank flooring throughout much of the main level. The formal dining room is open to the living space, and features lighted tray ceiling with wainscoting paneled walls. A sweeping wrought iron staircase and expansive landing overlooks the great room, which features built-in entertainment center and two sided fireplace, accentuated with floor to ceiling windows adorned with custom draperies.The living space is open to the gourmet kitchen, which offers an abundance of custom cabinetry, massive center island, granite countertops, full appliance package, and walk-in pantry. Sunny dining area leads to expansive covered deck with arched ceiling detail and two sided fireplace, all which overlooks the water garden! First floor owner's suite offers tray ceiling detail, and luxurious bathroom with his/her vanities finished in granite, separate shower with dual shower heads, garden tub and walk-in closet. Completing this level is an oversized laundry room with lots of storage, hanging and folding space, and a guest powder room with modern finishes. Just inside the entry from the garage is a mud area for shoes and coats, and the rear staircase, accentuated with skylights, leads to the opposite end of the second floor landing. On this level, you'll find an en suite guest bedroom with walk-in closet and dedicated bathroom, another bedroom with vaulted ceiling, walk-in closet and direct access to the hall bathroom with double bowl vanity. The third bedroom on this level offers a huge amount of play or workspace, two closets, and built-in desk with cubbies. Prepare to be "wowed" in true Vince Kimbel style, with the pub style bar and lower level. Full rear walk-out of living space offers 9', 11', and 12' ceilings, u-shaped bar with TruRock countertops, two beer taps, two undercounter refrigerators, convection microwave oven, ice maker, plenty of storage and glass shelving, as well as built-in lighted display case for sports memorabilia. Custom murals adorn the wine cellar area, and dance floor with disco lighting! A lounge area with built-in entertainment center, and lower billiards area, both open to the other living spaces. Two tiered guest bedroom could also be home office or exercise room, featuring walk-in closet and second closet, as well as close proximity to the full bathroom on this level. Other bells and whistles include geothermal heating and air, Icynene insulation (just a few of the Energy Star features), whole house audio system, security system, irrigation system, central vacuum, Weatherbest decking material, three-car garage, gorgeous water garden with extensive stone lined fountain, and so much more! Seller offering one year home warranty. 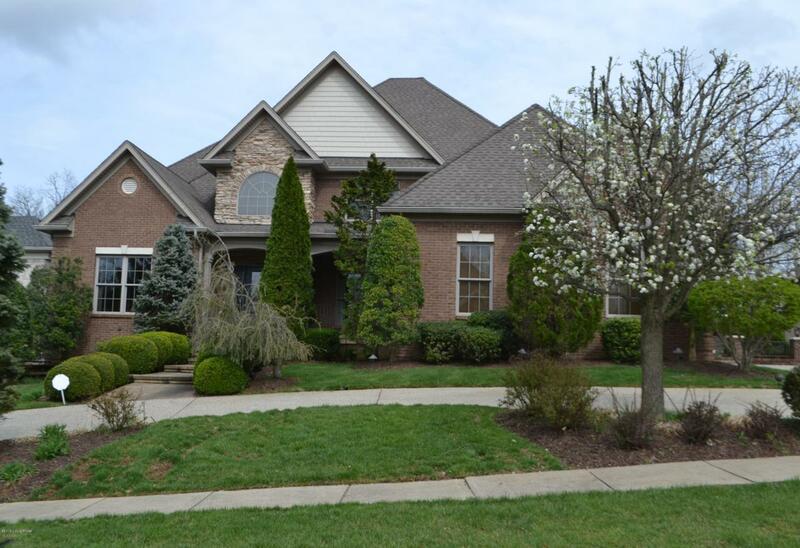 Call for your private viewing of this magnificent home! !